photograph by Wally Gobetz. 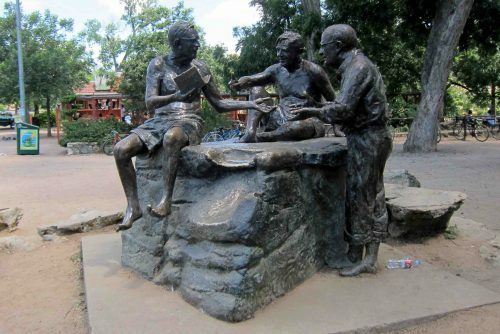 “Philosopher’s Rock,” outside Barton Springs Pool in Austin, depicts Walter Prescott Webb, at right, with fellow Texas writers Roy Bedichek and J. Frank Dobie. He was an unlikely candidate to become one of Texas’ most famous intellectuals. Reared on an East Texas farm, Walter Prescott Webb was, at 40, unemployed, having failed out of a University of Chicago doctoral program. Then, in 1931, he published “The Great Plains.” The book brought a groundbreaking perspective to the American West, and its history. It earned him a PhD from UT – and international acclaim. Webb’s reputation has ebbed and flowed since. His approach to women, Native Americans and Mexicans is often myopic – and sometimes loathsome. But there’s no doubt he opened an intellectual frontier. A westerner today reads “The Great Plains” with mounting recognition – a sense that this region, and its often-fraught relations with the rest of the nation, are being explained. Native Americans had flourished here. The Spanish – natives of an arid land – could cope. But for Anglo-Americans the plains were a shock. Their expectations, traditions, institutions would have to change to survive. It’s arguably an ongoing process. For Webb, there are three defining features of the land beyond the 98th meridian: it’s treeless, level and dry. 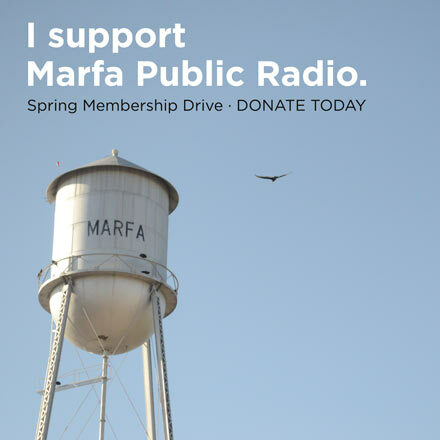 He means not only the High Plains, but the entire arid interior. For decades, that land was an obstacle to overcome, a trial to endure, to reach the wet, well-timbered Pacific Coast. But after the Civil War, Texas became a laboratory of Plains occupation. The Texas Rangers – formed to fight Plains Indians – were among the first to adapt. They adopted horsemanship akin to their opponents. And they adopted a weapon suited to fighting horseback: Samuel Colt’s “six-shooter.” Colt named the first version “the Texas.” The second was designed with a Ranger’s input. Webb describes the development of “perhaps the most distinctive institution American has produced”: the range and ranch cattle industry. With roots in South Texas, reliant on Mexican horses, longhorns and techniques, ranching spread across the Great Plains in a mere decade. Ranching was distinctive to the plains, but the U.S. was a farming nation. Bringing farming west also required innovation. In the absence of fencing materials, prairie farmers invented barbed wire. Windmills were mass-produced. Plains farming called for big machinery. But there was an implacable obstacle: limited water. With a farming history, it was a lesson Americans seemed determine not to learn. Promoters always promised more than the plains could give – or proffered a faith that “rain follows the plow.” Webb describes an event near Midland, when explosive balloons were detonated in hopes of creating rainfall. For aridity is finally the West’s defining reality. As Webb perceives, Major John Wesley Powell was the visionary here. After an expedition in the 1860s, he recommended a series of innovative proposals. Organize “the arid lands” by watershed. Expand the land offered under the Homestead Act. All emerged from the insight that, here, water, not land, is of prime value. Indeed, federal land law never matched Western realities. The most land ever available under the Homestead Act was 640 acres – a viable ranch nowhere in the West. Certainly the sense persists, that decision-makers are often ignorant of Western facts. Prophetically, Webb saw that water conflicts here would intensify. Webb ends his book speculating on the “mysteries” of the plains – the awe this vast land awakens. Ninety years later, this high lonesome land is still working its effect.